Accident and emergency departments should give patients smartphone heart monitors to take home with them, experts say. People who arrive at hospital complaining of heart palpitations, or who are suspected of having an irregular heartbeat, could be given the mobile technology. Researchers say these patients often find their symptoms have gone away by the time they get round to having a scan in hospital. And they found measuring the heartbeat using finger pads connected to a smartphone can be five times as effective at diagnosing heart rhythm problems and save the NHS as much as £900 per patient. The British Heart Foundation said using the device could be a ‘life-saver’. 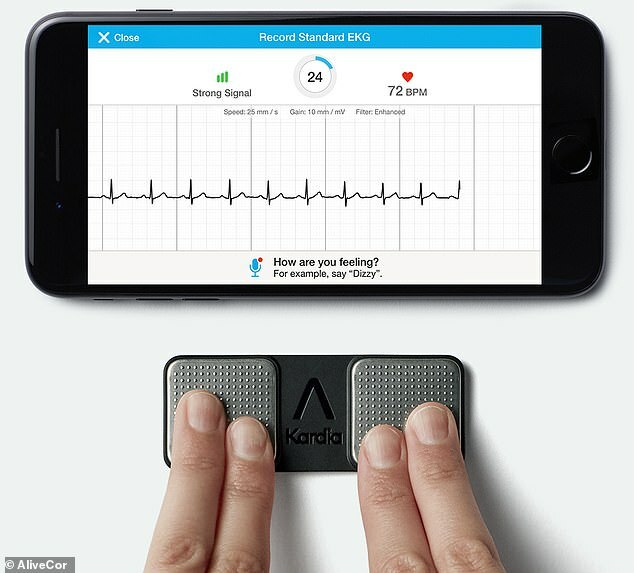 Use of the AliveCor KardiaMobile device was studied by researchers at the University of Edinburgh and NHS Lothian, the health authority for the Scottish city. The study involved 240 patients who turned up at A&E with heart palpitations or feeling light-headed. Just over half of them (124) were given the device to take home. It works by the user placing their fingertips on sensor pads which, connected to a mobile app, measure the heartbeat when someone is experiencing symptoms. This is then logged and can be shown to a doctor for them to analyse. Other patients in the study had normal hospital tests and, if no problem was found, were told to come back if they felt unwell again. After three months, 56 per cent of the KardiaMobile patients were diagnosed in an average time of just 9.5 days, while only 10 per cent of the other patients were, and they took an average of 43 days. Diagnosing patients with the take-home device is also less than half the price, costing just £474 compared to £1,395 for hospital visits. A normal heart rate should be regular and between 60 and 100 beats a minute when you’re resting. It can affect adults of any age, but it’s more common in older people. It affects about 7 in 100 people aged over 65. You may be aware of noticeable heart palpitations, where your heart feels like it’s pounding, fluttering or beating irregularly, often for a few seconds or, in some cases, a few minutes. GPs are already using the KardiaMobile in some areas but experts want to see them used widely in hospitals. ‘We’ve shown that this device is an easy, cheap way to diagnose heart rhythm problems which usually see people attending emergency departments several times before they’re diagnosed,’ said Dr Matthew Reed, from Edinburgh Royal Infirmary. ‘For those with harmless palpitations this device can quickly give reassurance, whilst for those with serious underlying heart conditions it can act as a lifesaver. The mobile monitor is able to take on-the-spot electrocardiogram (ECG) tests which are used by doctors to measure heart rhythms. People who experience heart palpitations often find their symptoms have gone away by the time they make it to a doctor, and nothing shows up on their ECG, the researchers said. And, although the symptoms are often harmless, they can be a sign of an irregular heartbeat – known as atrial fibrillation – which can increase the risk of a stroke. The British Heart Foundation’s associate medical director, Professor Jeremy Pearson said: ‘By taking advantage of the tech that we carry around in our pockets every day, this cutting-edge device makes sure that it’s easy for people experiencing palpitations to directly record their heartbeat. ‘They can then relay the information rapidly to a doctor and improve their diagnosis. NHS England’s Dr Matt Kearney added: ‘Untreated heart conditions like atrial fibrillation put people at high risk of stroke but can often be difficult to diagnose. The team’s research was published in the journal EClinical Medicine. Where are the stars of 'It Ain't Half Hot Mum' now?